1952 was a watershed year for baseball cards. It's credited by many as the year that the modern hobby began. Although Topps made cards in 1951, they were done as a game and are often overlooked. However, 1952 Topps Baseball stepped up and offered direct competition to Bowman for basic player cards. Larger cards, a bigger checklist and other things like stats and team logos were all made important parts of baseball cards with the set. Being such an important year, the most valuable 1952 baseball cards carry a lot of importance and prestige. They also cost a lot, no matter their condition. 1952 Topps Baseball is the most coveted of the major sets released in 1952. In fact, it's one of the most beloved sets of all-time no matter what era or sport you're looking at. 1952 Bowman Baseball is also an attractive set, but it doesn't have nearly the prestige. As a result, comparable players aren't as valuable as their Topps counterparts. Somewhat overlooked but still popular is 1952 Berk Ross Baseball. This is a little more of a fringe set that carries a much smaller checklist than both Topps and Bowman. However, it's relative scarcity keeps some of its key cards up in price. The bottom line is that it's hard to go wrong with any 1952 baseball cards. While condition is a major factor in how much classic cards go for, these Top 10 1952 baseball cards command big prices no matter what kind of shape they're in. Furthermore they have proven to be very solid investments over time, even in economic downturns. 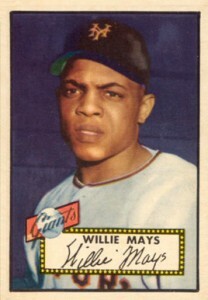 This is not only one of the earliest Willie Mays cards, but it's also one of the most gorgeous. However, because not all sets are held in equal regard, the 1952 Bowman Willie Mays is much more affordable than his first Topps card. 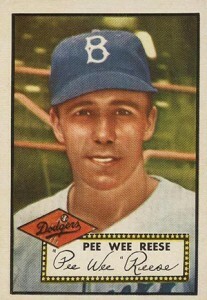 Although more than a decade older than his 1941 Play Ball rookie, the 1952 Topps Pee Wee Reese is the more pricey of the two. It's the result of being both a beloved Dodgers great and a high number short print. 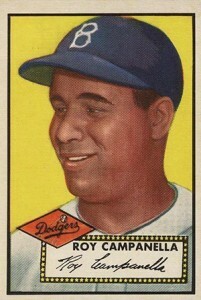 Roy Campanella's standing is a similar situation to Reese. Although his rookie came out much closer to the release of 1952 Topps, it's the short print factor that drives this card's value, usually into four figures if there's no major damage or defacing like writing on the card. 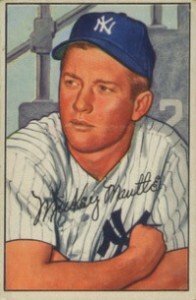 Want an early Mickey Mantle card without having to spend five figures? This is it. Sure, the 1952 Bowman Mickey Mantle isn't going to fit into every budget but it's still a lot cheaper than the legendary Topps version or his 1951 Bowman rookie card. It's still a beautiful card and one that is a more affordable alternative for those looking to build a high-end Mantle collection. 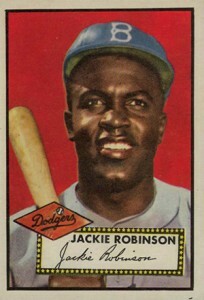 One of the most iconic and coveted Jackie Robinson cards in existence, this another another scarce high number card. Anything professionally graded above a 5 from PSA or BVG and you're likely looking at multiple thousands. And it's not even his rookie. Not all 1952 baseball cards are about Topps and Bowman. 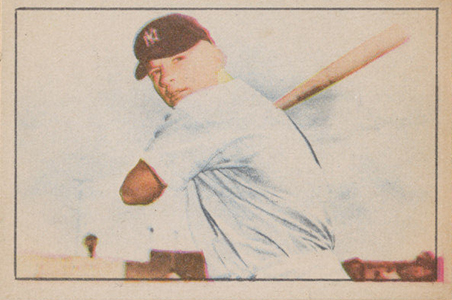 1952 Berk Ross includes an early rarity of Mickey Mantle that's extremely popular and pricey. Like his Bowman card, it's still a bargain compared to its Topps counterpart. Nobody's going to ever argue about the greatness of Willie Mays or his popularity. Although this is his second-year card, it's often the one that gets the most attention. Had it dropped down the checklist another 50 spots, it'd be more valuable than it already is. However, few wallets are going to complain about it missing short print status. 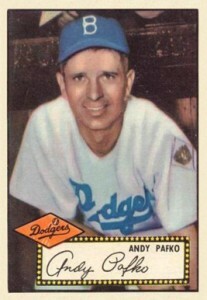 Andy Pafko was a great player through the 1940s and '50s. For collectors, though, his greatest contribution was kicking off the 1952 Topps set. As the first card in their first flagship set, there's tremendous historical appeal. Also, thanks to the wonders of antiquated storage options, it's a card that was on the top of many shoeboxes and rubber band-bound stacks. As a result, the 1952 Topps Andy Pafko is a lot tougher to find in top condition compared to a lot of other low numbers from the set. 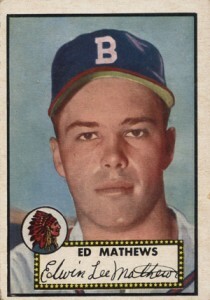 Eddie Mathews is the top rookie card in 1952 Topps Baseball. The fact that he's a Hall of Famer and one of the greatest sluggers of his generation would have been enough to make this a key vintage card. That said, supply plays a big role in this card's value. It's not only part of the rare high numbers, but it's the final card in the set. As a result, there are similar condition issues here as with Pafko, the card that kicked off the set. The 1952 Topps Mickey Mantle is the granddaddy of them all. As far as post-War cards go, it's the closest thing the hobby has to the T206 Honus Wagner. Mantle not only went on to become one of baseball's all-time greats, but did so at a time when baseball cards saw a lot of growth. Because of this he became the face of baseball cards, something that continues to a large extent still today. Mantle is a short print, meaning there are fewer out there. 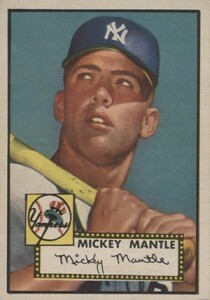 One common misconception about the 1952 Topps Mickey Mantle is that it's his rookie card. It's not. 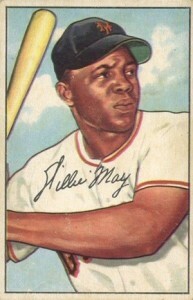 That card can be found in 1951 Bowman.